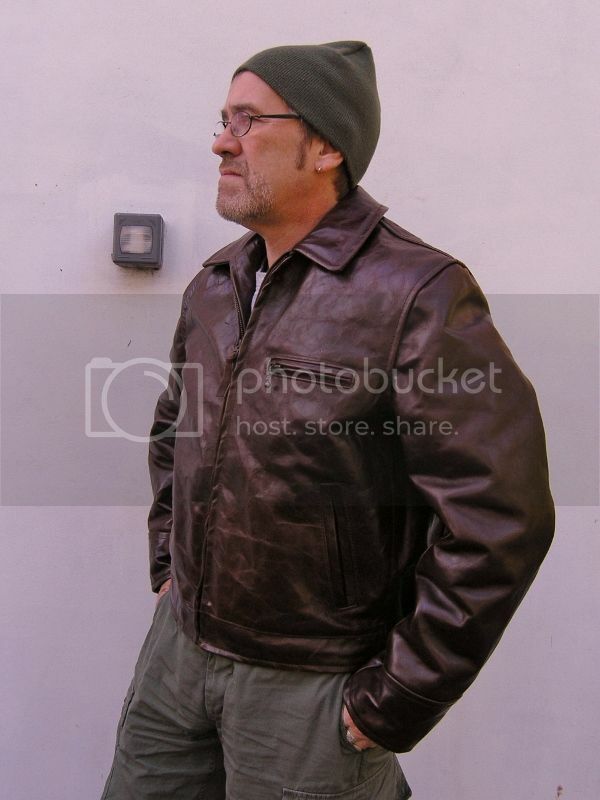 Discussion in 'Moto / Utility Jackets' started by Peter Graham, Oct 9, 2013. A while ago I realised that every single jacket I owned was military and bar my shearlings they were all green, khaki or camo and needing a new leather jacket I decided to steer away from military patterns. After a lot of looking and one false start I spotted this Aero highwayman on their trainee made jackets page, although this one was made by an experienced machinist returning from a period of absence. I could see by the photos on the site that this jacket had a lot more grain than normal and I loved the colour so I decided to go for it. It arrived last week. 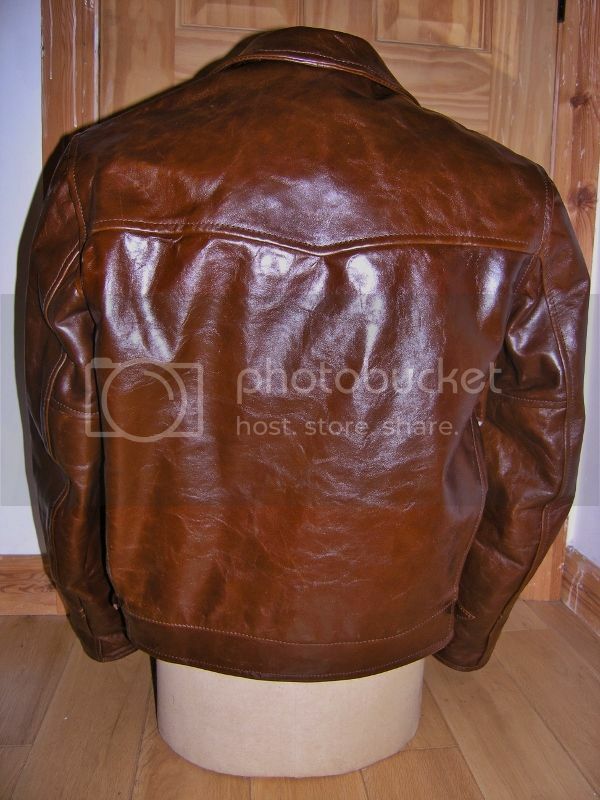 The first new leather jacket I've bought since 1989 ! The steerhide is quite thin but feels tough and certainly has a lot of graining straight out of the box. It's annoyingly creaky and quite stiff, especially the sleeves, but hopefully this will pass. I'm not sold on the knit inner cuffs yet as they feel very tight but I'm sure they'll loosen up. 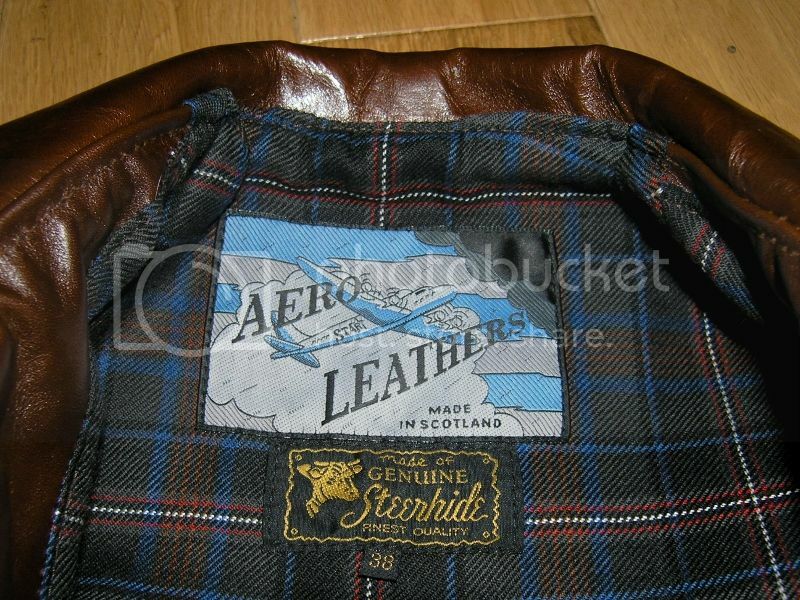 The quality of construction is great and the Lochcarron wool lining is beautiful. 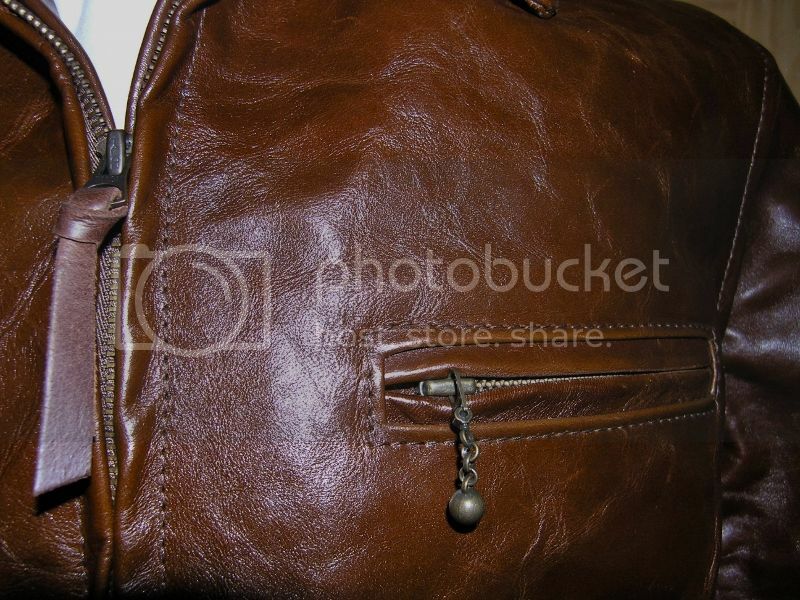 The fittings are dull brass, the zipper being Talon marked and a bit rough feeling at first but it's a lot smoother now. I hate the feeling of new jackets and always feel a bit self concious in one. Everything feels a bit stiff and awkward at the minute but I'm sure after a bit of wear it will feel a lot more natural. It better, because I'm not about to buy another one for several decades ! Here's some pics. Akang ed and Tommy like this. Does the military theme extend to the trousers as well? Pattern suggests so? I trust that this is a 'hefty' jacket? Thanks lads. I wasn't convinced when it arrived but I think this one will be a grower. You're right Couchy. Nam era tropical combat trousers. Not my normal attire but they are the only thing that will fit over my plaster cast. No, it's not terribly hefty. 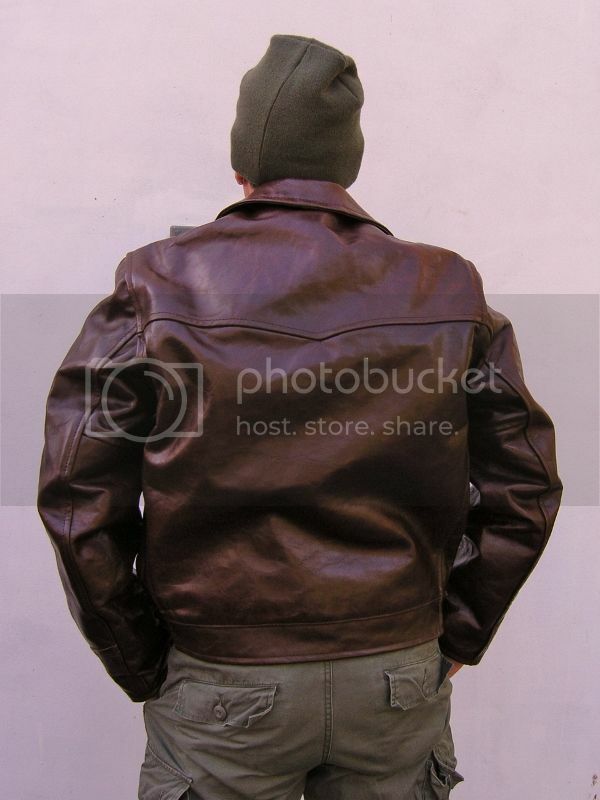 I've had heavier steerhide jackets such as an ELC Luftwaffe, but it was smooth as a baby's bum. This is fairly thin, but not in any way flimsy. I think that's what gives it such good graining. First new jacket since 1989??? Git outta here!! Looks good Pete. 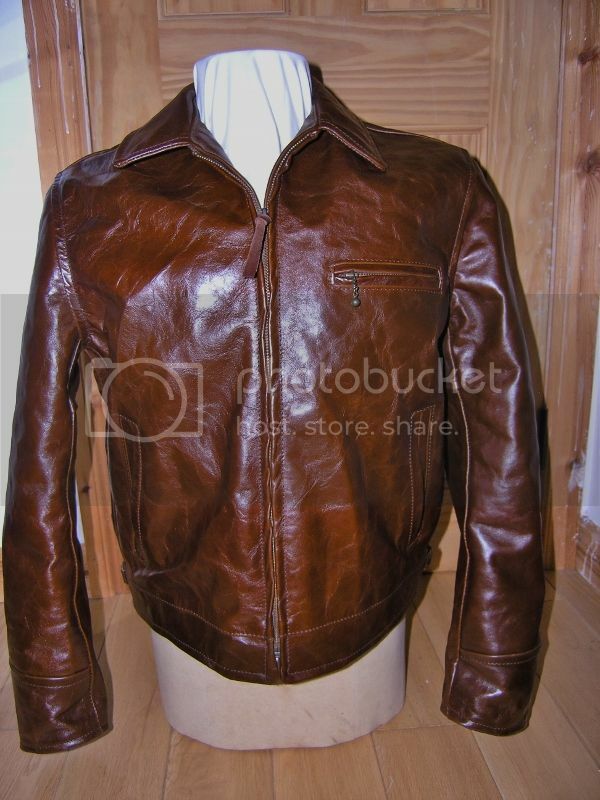 I had a Highwayman once, mine was buffalo hide, nice jacket but the shape didn't suit me and it got moved on. 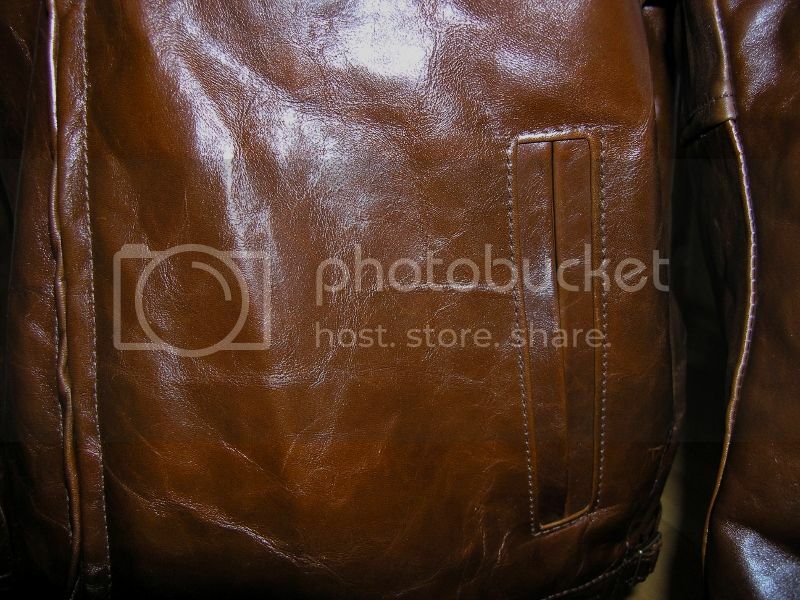 The side buckles were an annoying design which didn't grip, but yours are different to mine. Nothing wrong with a thinner, more flexible hide either. I used to be all for thick, heavy stuff, but having owned jackets like that, thinner is far more comfortable and no less hard wearing. Plenty of grain there too. That's going to look great with some wear on it. You know how Ken said they used to wear in a new jacket at Aero? Tie it up in a ball with string and go and play football with it! I think you misunderstood me Mike. It's my first brand new leather jacket since 1989. I'd hate to think how many have passed through my hands since, but they have all been second hand. 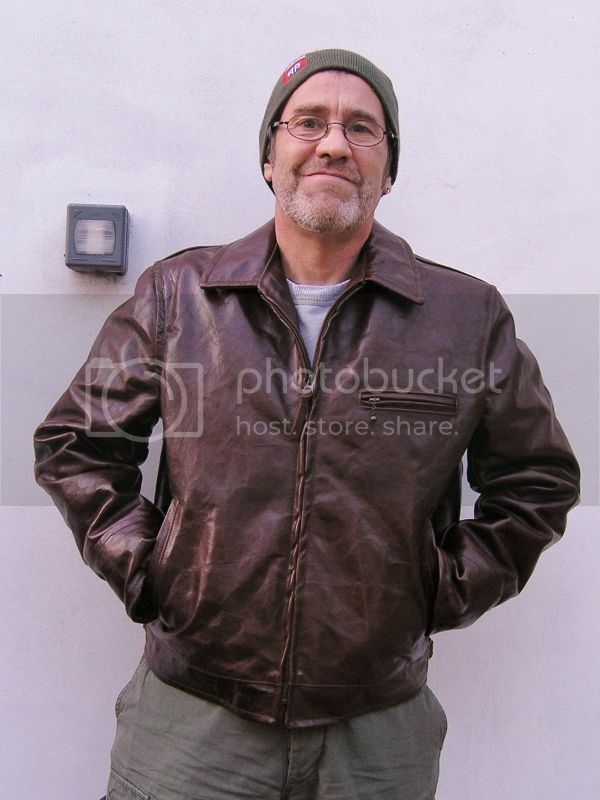 The last brand new jacket I bought was a Furygan bike jacket, £300 back in 89 and paid for with money from a claim I received for a broken leg sustained in a road accident while I was working as a motorcycle courier in London. No, I got you Pete. Have to admit I'm struggling to remember the last brand new leather jacket I bought-may well have been the Highwayman previously mentioned. It's all been second hand for me too. Nice score, Peter! That's a good-looking jacket. Just in time for real weather, too. Enjoy, and, thanks for the pics. 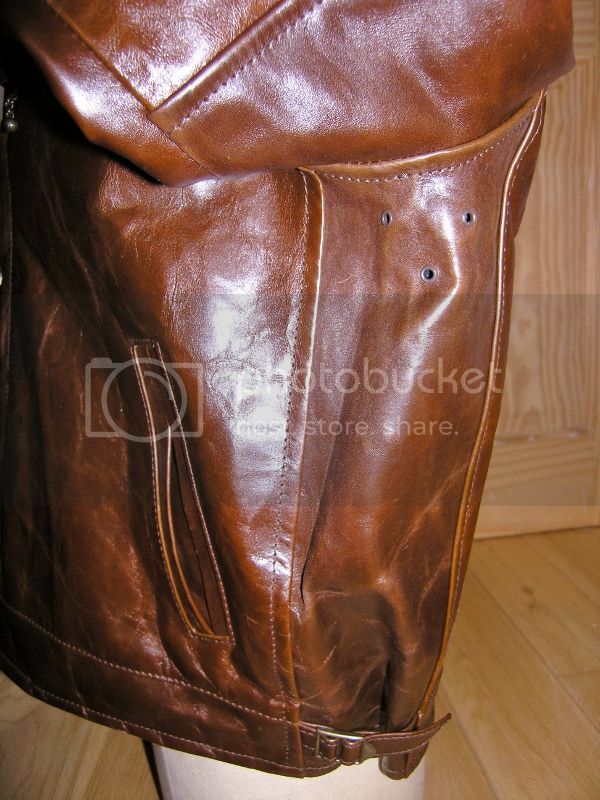 that jacket's sweet looking,remind's me of horse with the grain.looks crome tanned...either way,nice!!! remind's me of horse with the grain. That's what I thought too. Thanks for the compliment and welcome to the forum. An update on this jacket. Nobody likes to admit that they've made a mistake and I was putting on a brave face when I first posted this. In reality, when it arrived I was horrified. It looked horribly bright and shiny, it creaked, it was stiff and awkward feeling, the zips were practically impossible to zip up and it felt like it only fitted where it touched. I was this close to putting it back in the box and sending it back. Boy, am I glad I didn't. A few weeks of hard daily wear has transformed my feelings about it. The grain was about the only thing I liked about it initially and this is really developing now, helped by the wet weather we've been having. 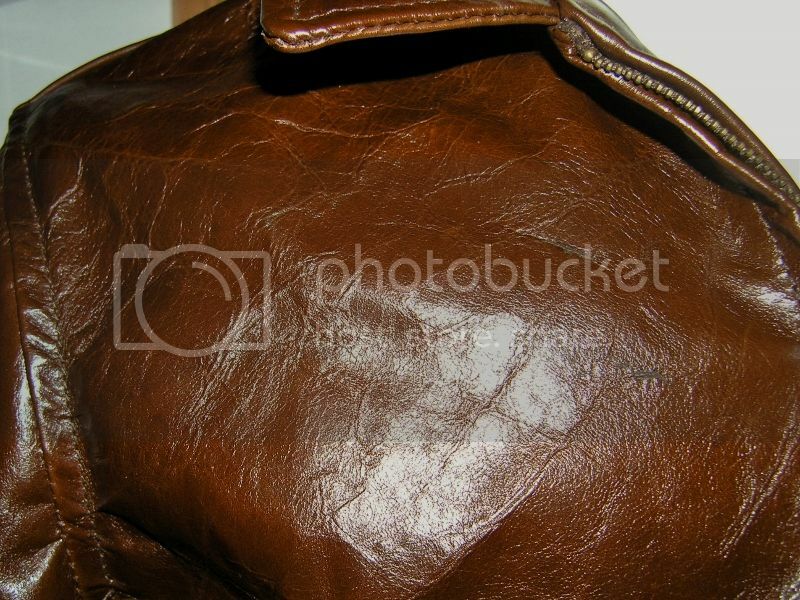 The top coat is wearing off along folds and seams revealing a lighter shade underneath. I hardly notice the knit storm cuffs now, which felt tight and restrictive and the zippers operate nice and smoothly now. The soakings have helped mold the jacket and the fit feels great now. Kind of like a D-1. Not baggy but not impractically trim. The waist adjusters do a great job when layering. Easy to adjust and they stay put. 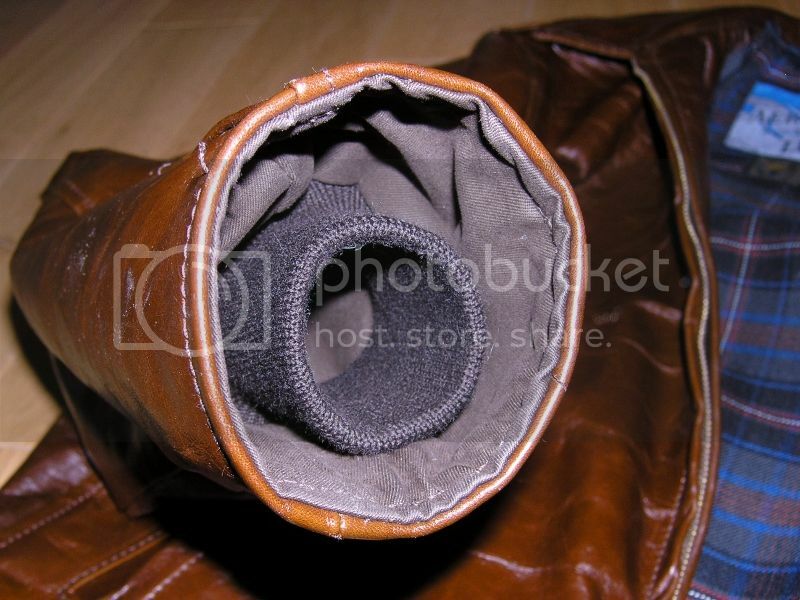 One of my favourite features about this jacket, which I didn't even mention before are the handwarmer pockets. Lined in heavyweight tan cotton, the pockets are really deep and angled just right so you can carry a wallet, keys, etc without fear of them falling out. This confidence is helped by the thick cotton having a velvety feel, which has a grippyness to it that keeps objects in place. So I've had a complete transformation in my feelings about the jacket and I wouldn't hesitate to recommend one to anyone. I knew there had to be a reason why the Highwayman is viewed as such a classic design. I'll post more pics in a year or so, when it's well broken in. Ken at Aero Leather and davyjones007 like this. what is the measurement of your chest if I may ask? Thanks Platon. My chest is 38". Most standard 38 jackets work for me although the occasional jacket may be a bit neat in the shoulders. This particular one is cut generously and gives lots of movement without being too large. As I said, like a D-1. I find the back way too generous for my taste. I know what you mean. It's actually the side panels that are wider than is maybe necessary. I noticed that on day one but I'm completely over it now. The jacket now feels like an old comfortable sweater, and that's due to the ease of movement afforded by the panel design. It may not be the most stylish jacket in the world but I love it. I'll post more pics in a year or so, when it's well broken in.